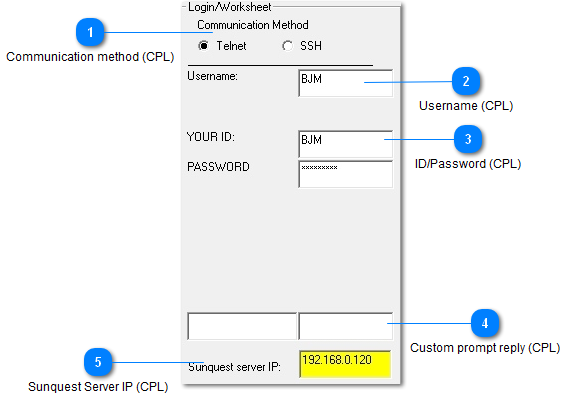 CPL (Antrim/Sunquest commercial) has a simpler login configuration. Should leave this at Telnet unless you have special security consideration. Username that you use to login to Sunquest. For security you should setup a special user with limited access just for use with Ol Monitor. ID and password to complete login to Sunquest. CPL, you probably will never need this. Ver 1.63 and above. Some sites may have an additional server login prompt. Copy or type exactly the login prompt that appears and the appropriate response to send (ie: password or login string). The server IP is the ip address Smarterm uses to connect to the Sunquest server. If you know the IP address of the Sunquest server enter it here. If you have already been using Smarterm to connect to Sunquest you can leave this blank and the program will search for your previously used IP's the first time it loads Smarterm. The field will highlight in yellow if this is the first time you are running Ol Monitor or if the saved ip is on the 'bad ip list'.